It seems I can’t get away from the topic of compassion. It is everywhere I look. I believe God is trying to tell me something. 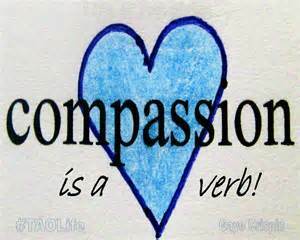 Merriam Webster: compassion: sympathetic consciousness of others’ distress together with a desire to alleviate it. Dictonary.com: compassion: deep awareness of the suffering of another coupled with the wish to relieve it. Not to toot my own horn, but I do have compassion for those in need and the sick. I feel their distress. I feel their pain. I want to help. I honestly desire to see them well and happy. Jesus calls us to have compassion for one another. 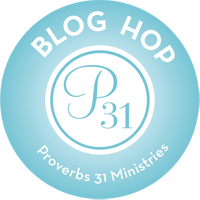 1 Peter 3:8 (NIV): Finally, all of you, be like-minded, be sympathetic, love one another, be compassionate and humble. I have met the definition of compassion as listed above, so I am good, right? WRONG! 1 John 3:17-18 (NIV): If anyone has material possessions and sees a brother or sister in need but has no pity on them, how can the love of God be in that person? 18 Dear children, let us not love with words or speech but with actions and in truth. James 2:14-17 (NIV): 14 What good is it, my brothers and sisters, if someone claims to have faith but has no deeds? Can such faith save them?15 Suppose a brother or a sister is without clothes and daily food. 16 If one of you says to them, “Go in peace; keep warm and well fed,” but does nothing about their physical needs, what good is it? 17 In the same way, faith by itself, if it is not accompanied by action, is dead. Over and over again we see Jesus MOVED by compassion (Matthew 9:36, 14:14, 15:32-38, 20:34, Luke 7:12-15-just to name a few). Compassion is not just an emotion; it is an emotion that leads to or causes action. It is not enough to want or desire to help; we must act on those desires to help. Sometimes the words “I’ll pray for you” are thrown out haphazardly. We don’t mean any harm or disrespect, but more often than not we do not follow through. We must take praying for others seriously. God can move mountains, all we have to do is ask and believe. Fasting is done little in churches anymore, and I think we should make it more common place again. Fasting not only lets God know we are serious, but it is a constant reminder for ourselves as well. I truly believe that just like faith without action is dead, compassion without action is useless. Thank you God and Pastor Cathy McCoy for this reminder. Lord, I come today asking not only compassion for others, but the strength, willingness, and abilities to help where help is needed. Do not let me turn a blind eye to those in need and help me to see which ones I can help or reach. How are you going to show compassion today?